Next time you go to a psychic fair or holistic expo, take a look at the tools that the intuitives are using. You’ll see crystals, and scrying balls, and angels, and runes, and all kinds of other paraphernalia. 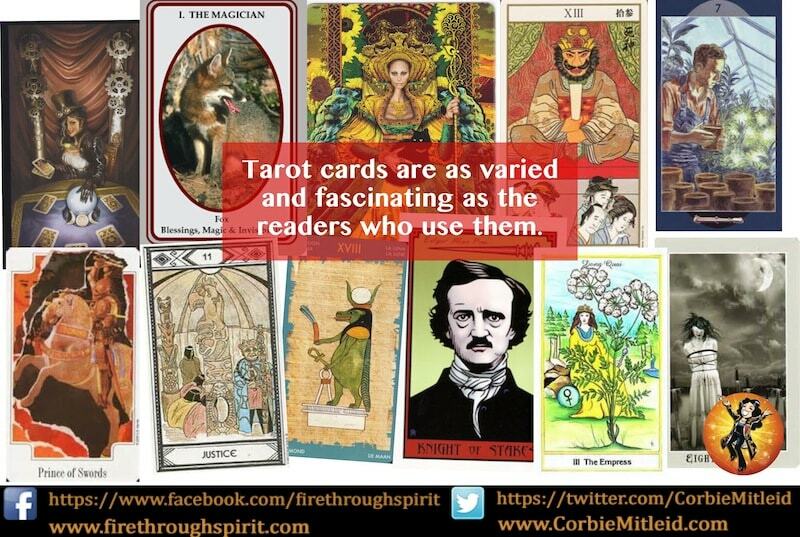 But regardless of what else they use, most readers will have Tarot cards with them. That’s because of all the divination systems in use today, Tarot is the most well-known. It’s a fair bet that most people outside the metaphysical community have at least seen a deck (think of movies like Live and Let Die or Practical Magic), even if they haven’t used one themselves. Tarot decks have been in vogue in the spiritual community for centuries. And today, there are literally thousands of volumes, courses, and instructors for discovering the ins and outs of those familiar 78 keys to wisdom. But Tarot now has to make room on the shelf for its New Age cousins. With the advent of the Spirituality and Metaphysical movements since the 1960s, people are creating countless decks that have nothing to do with the standard Tarot archetypes. Faeries, angels, dragons, Zen Buddhists, vampires, Steampunk and Goth aficionados all have cards dedicated to their realms of thought, and they’re in no way derivative of Tarot. Moreover, because there is no ‘tradition’ associated with these modern creations, there’s no standard way to read with decks like these. So the question is: without someone telling you ‘this is how you do it,’ how do you dance with your new deck? And how do you choose from the dozens of new decks out there? Pull up a chair and grab your teacup, my dears; we’re going to have a little chat I call the “Deck-a-Dance.” And I’m going to give you seven “dance steps” to use so that you can twirl on the dance floor (or the reading table!) with the best of them. FIRST, LISTEN FOR WHO’S ASKING YOU TO DANCE. Decks are as individual as the people who use them, and one person’s favorite deck is another person’s flea market leavings. So it’s important to recognize what will ring your chimes, zing your intuition and induce you to keep practicing your Art on a daily basis. I want you to take some time before you go shopping for your new divination partner. Close your eyes, and imagine perfect deck. How does it feel in your hand? Is the deck small and compact, or large enough for lush illustrations? Are the colors saturated or pastel? Indeed, is the deck in color at all, or do you groove to black and white? Is the deck designed around traditional artwork, photographs, or collages? Who is populating the deck – humans, animals, mythical creatures, or something else? Does it have ‘major’ and ‘minor’ groupings, or are all the cards stand-alone? Is the ‘feel’ of the deck light or dark? Each of these questions will help you find a deck into which you can dive deep, and come up with all kinds of interesting stories for the future. Fast forward… you’ve gone shopping, you’ve looked and felt and thought and weighed your options, and you’ve chosen your deck. You’ve brought it home, broken through the shrinkwrap and lifted the box cover. You’ll find your cards, a few “introduction and about” cards telling you about the designer, the thoughts behind the deck – and a book. Are you ready for a shock? Put the book down. And don’t open it. DON’T READ THE BOOK FIRST. MAKE YOUR INTRODUCTIONS. Now mind you, I have nothing against instructional books. They are usually written carefully and, indeed, lovingly by the person who collaborates with the artist on any deck. They can be wonderful treasure troves as you get to know your new metaphysical partner. But if you’re trying to hone your own ability to dig out meanings and gifts in your own personal deck, reading the book first might stifle your flights of fancy. With Tarot decks, it’s sensible to learn and understand the traditional meanings of each card — years, decades, even centuries of thought and conjecture underlie all the symbols and pictures. But when it’s a new deck, without a ‘history,’ that means all paths are open. And your path can be as individual as you are. And remember that expert readers know that cards are a world of their own. Each deck is its own domain. Now that you’ve entered your new “neighborhood,” shall we meet the neighbors? WHO LIVES THERE? Traditional Tarot decks are kind of like 1950s suburbia – but instead of everyone having a front lawn and a back lawn and a basketball hoop in the driveway and a station wagon, everyone has Major Arcana and Minor Arcana and court cards and four suits. But that’s not always the case with the new non-Tarot-based decks, so check yours out. Does it have an alternative set of divisions – families, or colors, or affiliations? Look at the faces (human or Other) in the illustrations, how the creatures are placed, or how they present themselves. What personalities do you sense in each one? Don’t fall into the easy trap of simply overlaying typical personalities given in a Tarot deck. Instead, dive in and find out what’s unique about your deck’s denizens. Divination decks are different – vive le différence! So here you are in the neighborhood. You’ve hung out for a little while and said hello. If you’re like most people, there will be that certain someone that will turn out to be your “best buddy.” Let’s go pick out your deck’s BFF. FIND A SPECIFIC TEACHER CARD FOR YOURSELF. This is yet another case where you are not only ALLOWED to “break the rules” but you’re actively encouraged to do so. In a traditional Tarot deck class, you’re usually assigned a Significator court card for yourself by gender, age, and/or hair and eye color. But to me, that doesn’t take into account your preferences, your personality, or those of the beings in your new deck. Face it – what good is being assigned a card by hair and eye color when your deck is populated with crystals, aliens, or a bunch of bald guys with sunglasses? (No, I haven’t seen that deck yet, but it’s probably in the pipeline.) Instead, actively engage the beings in the deck. Literally let your energy sink into each card. You are going to feel a “pull” to one card, one image, that feels like it wants to open up your mind and imagination. THAT is your BFF for the deck. Remember: the more ‘energy’ we give an idea, we bring it into being as a thought-form. If there is one image, one being that reaches out to you, sit down with he/she/it/they and see what they have to say. So you’re in the neighborhood, and you’ve got your buddy. Let’s decide what you’re going to do together. WHAT ARE YOU SEEKING TO LEARN? There are three main ‘paths’ that a deck can illuminate. The first are the everyday (physical/mental) options and choices for our practical lives. It’s what I call the Everyday Tour Bus: house, car, job, kids, finances, Okay, God, you put me here, what the heck am I doing next? The second question category, emotional wisdom, helps us understand WHY we do what we do, and gives us some direction on how to shift our life experiences. Examples of this might be why do I always seem to choose unsupportive relationships…how can my spouse and I communicate better…what sort of employment might fulfill me more than my current job? Notice that in these situations, you get tools to make changes, rather than being told “this is the change you need to make” without your decisional input. And then there’s that deep third category, spiritual direction. Here, you might simply choose a certain number of cards, and allow them to help you download messages from your own guides or angels. You might ask the deck to pull together the meaning behind a group of occurrences to see if there is a spiritual “lesson” you might be missing. Or you might simply ask “what do I need to know to grow today?” and see who shows up for a celestial Play Date with you. Depending on how you intend to use the deck, the meanings and groupings you see may shift and change as your questions flow from one category to another. So you have your three categories of subjects. What about how to frame the question? There are lots of different ways to read, just as there are lots of different spreads to use. But generally, questions fall into two distinct categories. The first category is called DETERMINISTIC (sometimes called PREDICTIVE). For example, you might want to know if you should buy this car…which boyfriend/girlfriend is better for you… should you take that job? These are rather typical “fortune telling” questions, and while they have their place in an advisory capacity, they are not always empowering, in my opinion; don’t always go for the yes/no answers in a session. Instead, stretch your possibilities, and be ready for the alternative you don’t already know exists. I prefer questions that are FACILITATIVE. For me, these are the empowering structures that help you understand your life, and show you a series of choices across the board so that you can explore every option. These leave choice and free will to you, and teach you how to best fulfill your dreams by reaching for the positive and the expansive. Now that you know your deck and you have an idea of how to ask for information, let’s figure out how to get the best and the most information. PEOPLE GO TO THEME PARKS FOR A REASON. WHAT’S IT LIKE IN YOURS? The fact that you don’t have the same imagery that every Tarot deck is expected to have means you can interpret your deck’s worldview in wonderful and unique ways — and one of the best ways to do that is to design your own spreads for using it. If your deck has a particular theme, play with it! Let it expand the possibilities. If the deck primarily depicts flowers, form a plant with the layout. What are you ‘planting’? What do you need to ‘fertilize’ your future? What ‘bugs’ – problems, stumbling blocks, challenges – might be eating away at your time, your resources? A lot of decks have medieval themes, which lend themselves right off the bat to three layouts: a church, a castle, or a jousting field. In the church layout, try asking questions about what ‘penance’ might clear a challenging situation, or what ‘blessing’ might be bestowed by an action. For the castle layout, maybe the questions are what ‘moat’ do people have to cross to get close to you? How do you let down a ‘drawbridge’ to cross from one part of your life to another? What meaning can you give to each of the rooms? And if you decide you want to try out the jousting field, ask what two solutions or situations are battling it out for your attention? Even a NASCAR deck could work, if you thinking is turbocharged: what do you need to do to ‘tune up’ your life? Where does the ‘oil’ need changing, in terms of what makes life easiest for you to deal with? Where do you always get a ‘flat tire’ or ‘run out of gas’? This kind of wild playtime is where you go from dilettante to diviniation diva – when you don’t automatically go to a three-card layout or the ubiquitous Celtic Cross ten-card spread, the possibilities for exploration are absolutely endless. NOW THAT YOU KNOW WHERE THEY LIVE, INTRODUCE THEM TO YOUR NEIGHBORHOOD. Your neighborhood is the 21st century, and there is so much that has changed, even in simply the last few decades! It’s mind-boggling how much the original divination decks never addressed that are everyday challenges for us. That’s why it’s valuable to take time to introduce your deck to modern life: the internet, social media, the shifting family landscape, the tasks that are important to us today. In the 21st century, ‘multitasking’ is vital for most of us; in the 19th it wouldn’t have been thought of. Ditto today’s methods of commerce, consumerism, communication and employment. Which cards in your deck will signify these new ideas and modalities? Here’s an example using a standard Tarot card: the eight of wands is often read as speaking about communication. In my Tarot deck, it talks about the Internet now along with traditional interpretations – and it works; the deck understands that has to be part of its purview. Making the ‘stretch’ to work with these ideas in your deck can do wonders to deepen a reading. So there you have it – how to welcome Divination and Oracle decks as a new part of your Metaphysical Tool Box and get the very most out of your time with them. Are you inspired? I hope so! So go to either your brick and mortar store or your click and order emporium, and start looking for your new Lightworker partner. I’d love to have readers out there who use non-Tarot decks share their ideas. Please tell us what kind of deck you use; why you chose it; and what kind of readings help it really “shine” for your clients.